Helbling Readers Red Series is aimed at young teenagers. 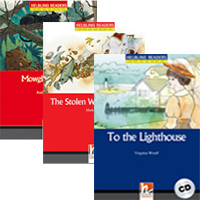 (år 7-9) It includes a selection of adapted classics and original fiction to get your students reading for pleasure right from beginner level. Helbling Readers Blue Series is designed for teenagers and young adults. (från år 9 och uppåt) Readers chose from sensitively adapted teen-relevant classics and a gripping selection of original fiction.